They’re still out there – some near, most far, all wide-open places waiting to expand your horizon. One of these places is the Santa Elena Cloud Forest in Costa Rica where a dense shroud of mist blankets the tight canopy. Golden flecks of sun penetrate the leafy ceiling and dapple the forest floor. Succulent epiphytic plants cling to soggy branches, absorbing drops of moisture from the air. A sparkling violet sabrewing buzzes past, stopping momentarily to scrutinize strange new visitors who have entered his enigmatic realm. A dung beetle busily drives a spherical gift for a female. A three-wattled bellbird bonks on a high branch to attract a mate. You are in a forest where clouds meander quietly through the understory. Visibility is about a hundred feet. All is quiet. Suddenly, from above, you hear two deep, smooth melancholy notes. The first note rises slightly and the second descends. As you begin to examine the interlaced branches above, the melody repeats. Then abruptly you see a blur of scarlet and green streak across your field of vision landing on a branch only twenty feet away. The clouds drift past and you’re dazzled by a brilliant emerald gleam of an adult male Quetzal. From the top of its Mohawk-like crest, through its metallic green plumage surrounding a crimson red breast, and its long green and a white tail, there is three feet of this incredible bird perching before you. The Resplendent Quetzal, it is one of nature’s ornate creatures and its home for most of the year is highland cloud forests. What commonly is called the “tail” is actually a pair of two foot long feathers known as tail coverts. In flight this elegant train of glistening emerald shimmers and sways much like the long ribbons of rhythmic gymnasts. The male flaunts these feathers during the mating season in a spectacular display flight in which it flies 150 feet upwards and comes swooping down in a graceful arc. The Quetzal was revered by Mayans, but only royalty was permitted to wear its feathers. Mayan kings wore headdresses of dozens of the long feathers with their stunning iridescence. Montezuma, the Aztec supreme ruler, wore a cloak of over seven hundred magnificent Quetzal plumes. 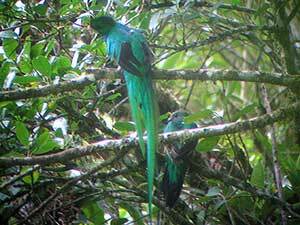 Will the Resplendent Quetzal continue to survive for at least another two hundred centuries so our great-, great-, great-grandchildren can continue to admire this glorious bird in the Santa Elena Cloud Forest, like their ancestors? From San Jose take the Interamerican Highway north to Puntareas. Go another 12 miles (20 km) to the turnoff for Sandinal. The road is paved for a few miles but then be prepared for a bumpy drive. 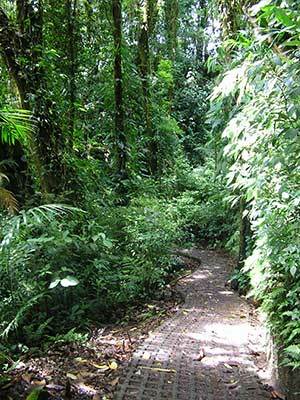 Thirty-nine spine jarring kilometers later you arrive in Santa Elena and then it’s a short 3 km to the Santa Elena Cloud Forest Preserve. The Hotel Belmar is a beautiful Swiss chalet-style hotel (www.hotelbelmar.net) on the grounds of which I saw plenty of wildlife and heard the three wattled bellbird during my stay. The cost was $80 per night for a double. If you are looking for an inexpensive place to stay try The Arco Iris Lodge in Santa Elena. A regular room with bath is only $50 per night, and budget travelers can stay in the “Bunk Rooms” for just $18 for a single or $28 for a double. With over 40 hotels in the area, one can always find a room for the night! The Morpho’s Café, in Santa Elena offers good, hearty, economical meals, with so much food on the plate you can’t eat it all.